These are not just your ordinary leftover cassette tapes with mixed music on them that missed the numerous decluttering sweeps that have occurred here in Obso land. Nope, they fall into the “Art” category. I did this project where I interviewed a bunch of people I knew and asked them some secrets. I promised I would never play the audio. I do still have the tapes and here they are, possibly demagnetized or whatever fate befalls old cassettes. Status: Unwind (carefully with gloves and mask – because I did that once before and found out it it’s bad for you) and photograph heaps of tape. Possibly feed to sea monster. Secrets are up her alley. Variation(s) on Titles: Untitled No. 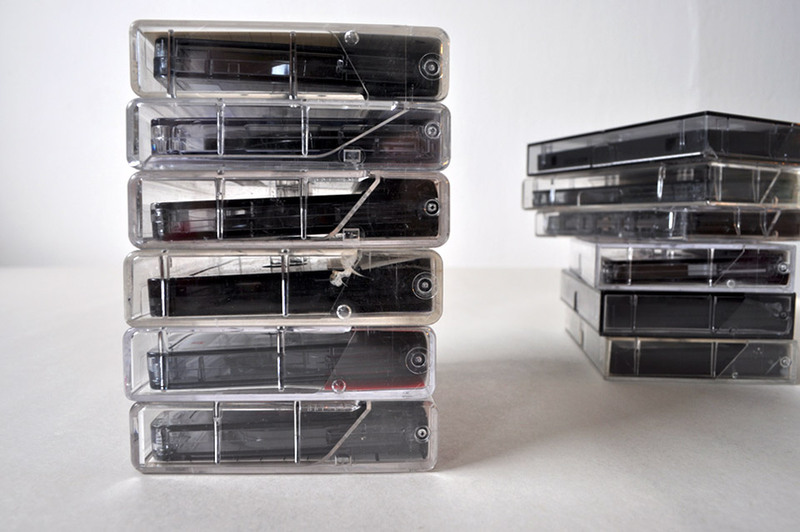 118 Cassette Tapes. Refer to Day 117 and Day 116 for this titling thing and more jokes. And, of course, The Future is Papier Mache and notes to the milkman are to be thanked for this latest fixation. And so is A Year of Living Sober, for his joke format. p.p.s. OT Mini Karma Update – I also found 3 cassette tapes that did in fact have mixed music on them. They are now recycled and trashed. Phew. When I find old cassettes I don’t know what to do. I end up throwing them away but my attachment to them remains strong. Damn you outdated music format. PS. Thanks for big up for Year of Living Sober!